This infinity style bench has angled sloping edges and features a durable seat made with 3/4" # 9 expanded metal welded inside a strong 2" angle iron frame. 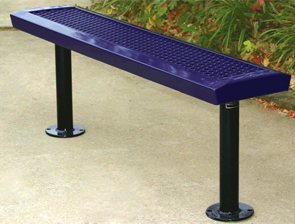 Usable from both sides, this conveniently designed bench is manufactured with the latest thermoplastic coating technologies, is corrosion resistant, maintenance-free, and will not warp, crack or peel. These benches are offered in your choice of portable, in-ground or surface mount. Benches are constructed with sturdy	2-3/8" O.D. legs, and can be ordered with optional grout covers. 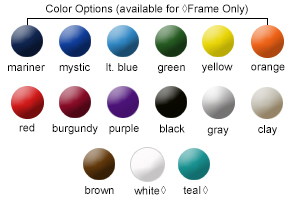 Choose from a wide variety of vibrant colors for both the powder-coated frame and thermoplastic coated seat to match any furniture you may already have. The Polyethylene finish gives it a lightly textured, matte feel.